Item #GSJ-2451: 18Kt. 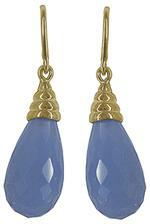 Yellow Gold Earrings with 11x21mm tongue shaped Blue Chalcedony of 17.38 Cts. TW and twelve channel set round Diamonds of .48 Cts. TW. Post backs. Item #TBM-BR800725: Adjustable 6"-8" long 18Kt. Yellow Gold Bracelet with bezel set Blue Chalcedony and Amethyst Cabs; Lobster claw clasp. Item #AD-E81-4775N: 14Kt. Yellow Gold Earrings with two Blue Chalcedony briolettes of 8.63 Cts. T.W. ; Shepherd's hooks. Item #15629: 14Kt. Yellow Gold Lady's Ring with one 8x10mm half bezel set oval Blue Chalcedony Cab of 2.82 cts. and sixteen channel set princess cut Amethysts of .82 cts. TW. Size 6½. Item #JP-H6: Sterling Silver pendant with 18x25mm oval Purple Chalcedony Cab. Item #JP-H7: Sterling Silver Pendant with bezel set 27mm heart shape Purple Chalcedony Cab.